I have never been a winter person, so I am trying REALLY hard to have the fashion help me through! I do love scarves, and I have so many blanket scarves because they keep me warm! And they really add a dash of fashion to any outfit. This week, I wanted to talk about one of my favorite winter outfits (minus my giant puffy coat of course!) that I got for fairly cheap at Old Navy and Nordstrom! I have been on the hunt for a good plain black tee shirt, with long sleeves and a scoop bottom! They are super hard to find for some reason, but I love how casual they are and how soft the material is! I finally found one at Old Navy, and as I was walking out, I saw this scarf! I pretty much live in black, white, tan and blue, so this scarf was perfect! It totally fits into my aesthetic. I snatched these two up, and paired it with my FAVORITE boots, Timberlands! I also have never felt like I looked good in wedges, but I absolutely LOVE Timberland brand, so I had to try them, and they are sooooo comfy! 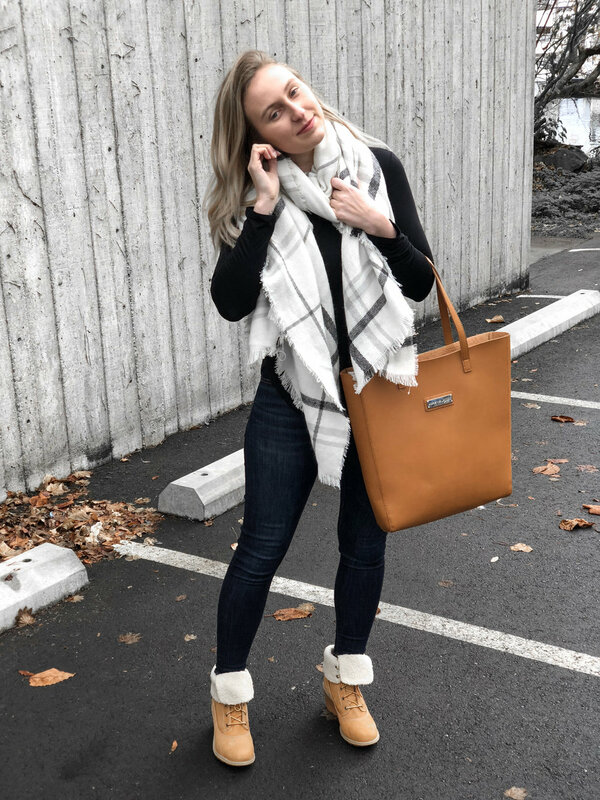 I love how they are fleece lined so not only are they super warm, they are the perfect choice for a more feminine winter boot! I've included a few photos of this outfit, enjoy!